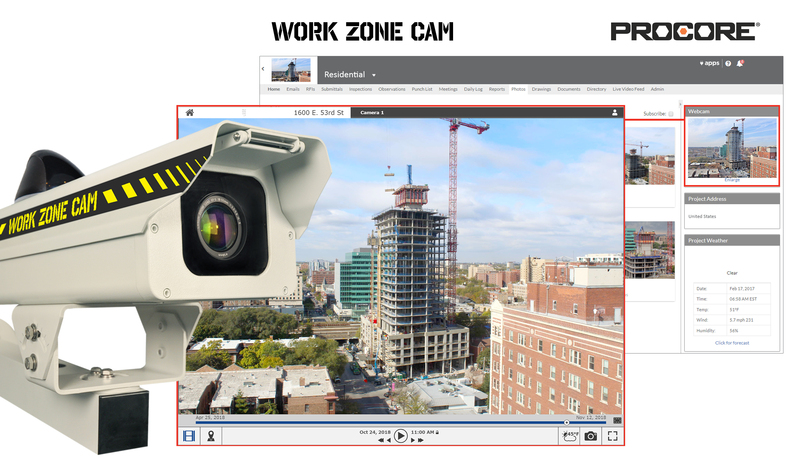 Work Zone Cam, the leading provider of professional do-it-yourself time-lapse construction cameras, has partnered with Procore, the world’s most widely used construction project management software, to integrate webcam content into their user platform. Through the strategic relationship, Procore users now have access to Work Zone Cam’s high-quality webcam technology, including highly-detailed 18 megapixel photography, to document important construction projects. All of the content is shareable via Procore albums, creating one unified location for a successful and efficient project management process. The Work Zone Cam Pro time-lapse system offers both a DIY option where users can transfer images directly to their server and a fully-hosted cloud-services option. With Work Zone Cam’s managed services, clients get the additional benefits of live video burst for real-time views of jobsite progress and 4K time-lapse movies for marketing. A solar power kit is available for a hassle-free 100% wireless installation. Systems are available for rent or purchase and come with a lifetime warranty. Work Zone Cam provides smart tools for Procore users to enhance communication and create a more efficient jobsite through the use of visual information. With Work Zone Cam’s image comparison tool, users can easily compare historical photos to make informed decisions. Users also have the ability to access their Procore contact list and share important Work Zone Cam progress images directly with them. The visual content lends support for RFI management, verifying punch list tasks and expediting submittal reviews. Procore users also receive the benefit of embedding their professional Work Zone Cam time-lapse movies to share on the Procore dashboard or company YouTube channel. Time-lapses are automatically updated throughout the course of the project and include a custom opening graphic incorporating the company logo, project name and thematic music track to create a fully-produced movie that’s ready to share. Another valuable project management asset is the Control Center 8 mobile app, powered by EarthCam. With the app, users can remotely view and manage their jobsites from anywhere at any time, and have the ability to share visual updates from the app directly into Procore. Efficient access to jobsite content also comes in the form of a new single sign-on (SSO) feature using Procore login credentials for a simplified process. Work Zone Cam’s webcam technology and new Procore integration will be featured at EarthCam’s exhibit at Groundbreak, November 13-15 in Austin, TX. Visit Exhibit 106 to learn how to integrate Work Zone Cam’s high-quality webcam content with Procore. Work Zone Cam is the leading provider of economical time-lapse construction cameras and services, and is the only professional camera offering both do-it-yourself and hosted services options. Founded in 2010 and backed by award-winning technology licensed from EarthCam, the 4G LTE wireless and solar-powered webcams are ideal for documenting projects of all sizes and producing 4K quality time-lapse movies. The all-weather DSLR cameras serve applications in the construction, education and entertainment industries. All-inclusive fully-hosted services include a lifetime warranty and support by responsive customer service professionals. Projects documented by Work Zone Cam include: National Building Museum, Chicago O’Hare Modernization Program, University of Notre Dame Campus, Orlando Citrus Bowl, California Department of Transportation, Grace Farms, T-Mobile Arena, Petersen Automotive Museum, FSW Suncoast Credit Union Arena and retail developments for 7-Eleven, Whole Foods and Yum! Brands. Learn more about the Work Zone Cam solution at http://www.workzonecam.com. Procore users now have access to Work Zone Cam’s high-quality webcam technology, including highly-detailed 18 megapixel photography, to document important construction projects. Users have the ability to access their Procore contact list and share important Work Zone Cam progress images directly with them.